The setting is once again the Scottish Highlands, where mythical creatures, witches and elves lurk among the dense forest. Asleep in his hut, the shepherd James is awaiting daybreak. It is a special day: he is due to marry his fiance Effie. But in the early dawn hours, a winged fairy suddenly materializes, falls in love with the shepherd, and wakes him with a kiss. This has grave consequences. 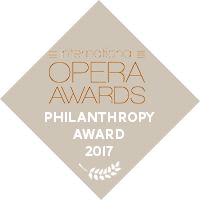 The Award Night dinner will take place after the performance at the Festspielhaus with the winners, the jury members, and the Festival’s representatives.